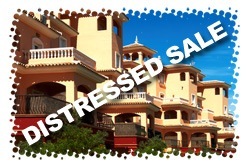 What are distressed property sales? Distressed property sales are properties that need to be sold quickly and this can be for a number of different reasons. Normally, and especially at the current time – the main reason for distressed propertysales coming on to the market is due to the property owner not being able to keep up with mortgage repayments that were set out in the terms by the bank, the mortgage repayments may also be in arrears with the owner facing possible repossession by the bank if payments are not paid up to date. Distressed property sales can also be due to personal reasons, family, work, health … there are many reasons why a property can become a “distressed property “. Why purchase a distressed property sale? Firstly, these type of properties, most often than not, are below market value, prices can be negotiable and depending on the severity of the owners situation – thousands can often be saved. In our own personal experience of selling distressed property, discounts of up to 20 – 30% of the real bank valuation of the property are not unseen hence the reason buying distressed property are in such great demand. Not only do the buyers get a cheap property but also the seller gets to sell their property quickly which depending on their circumstances could save them thousands if the property is in risk of being repossessed, or if it is for personal reasons – the property is one less thing to worry about. Why not purchase a bank repossession then? Simple, unlike distressed property, bank repossessions are not always as cheap as you first might think, it all depends on how much the property in question owes the bank from its outstanding mortgage that was aquired in the first place to buy the property. Then, here in Spain you will also have to pay an administration fee which is roughly 10% of the value of the property, that will be payable to the bank. If you are looking for a below market value property or a distressed property – why not contact us today and one of our members of staff will be able to advise you on what properties are for sale and what properties are within your budget. Address – Calle Clemente de Gosalvez 28b, 03180, Torrevieja, Alicante, Spain. Do you need to sell your property on the Costa Blanca south fast due to a personal or financial problem? Why not take a look at our “Sell Property Spain" page, fill in the request form and one of our members of staff will soon be in contact with you do discuss marketing your property. Take a look at the properties we have on offer at the Resale Centre, an excellent selection of bank repossessions, distressed property and extremely cheap Spanish properties!